Prime Minister Narendra Modi will launch the government’s new campaign for financial inclusion, which will provide facilities of savings, credit, remittances, insurance and pension, among others to 75 million households that do not have access to banking services at present, said Finance Minister Arun Jaitley on Thursday. Jaitley added efforts would be made to introduce mobile banking on all kinds of phones. He said this mission mode programme was a marked shift from earlier effort where only opening of account was the focus of the financial inclusion drive. “The objective is to have two accounts in each household. There are many elements of a new programme in it. 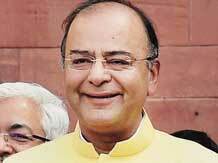 The unit of contact will be a person, not a village,” Jaitley said after a meeting with the heads of public sector banks (PSBs) and financial institutions. 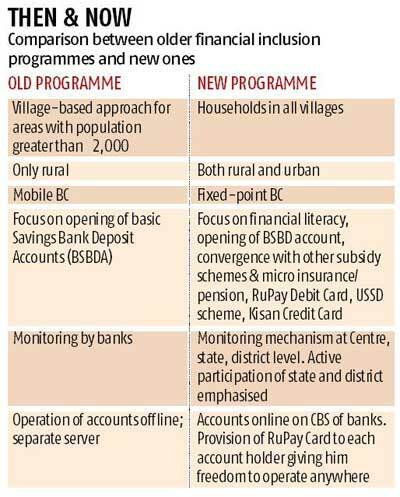 The Financial Inclusion Mission has two phases starting from August 15 this year. The first phase will get over by August 14, 2015, and the second by August 14, 2018. Most of the activities will be done in phase–I and insurance and pension would be covered in phase–II. There would be state-level and district-level committees to monitor the progress under the plan. Currently, financial inclusion and the reach of the banking system extends to about 58-59 per cent of the country’s population. The finance minister said technology has made rapid strides in recent times and, therefore, the government must use technology, especially mobile-based services, in a big way to achieve the desired results. The government has integrated provisions of access to banking facilities, account opening, financial literacy, credit availment, micro insurance and pension. This campaign for inclusion will be at various layers. In some areas, where branches are possible, the regular brick and mortar branches will be created. Where it is not possible, there smaller branches manned by one or two people would be created. The layer below that will be kiosks, and yet another layer below will be ATMs and then the human contact through business correspondents (BCs). Jaitley said the primary method of branchless banking has been that of the BC, and thus it was important to ensure that BCs have a viable business model. For this purpose, the government will encourage transfer of subsidies directly to bank accounts of the beneficiaries. The finance minister also said there was no pull factor in the earlier campaign where people could demand access of banking facilities in their villages. He added that under the new Mission, there would be awareness generation amongst the people so that they can ask for opening of their bank accounts by the banks and the business correspondents. He said in the past, the Know Your Customer (KYC) process was very cumbersome. This has now been eased and e-KYC facility introduced.